Article first published as Book Review: ‘Day of the Dog’ by Mark Salvi on Blogcritics. “Day of the Dog” by Mark Salvi is a semi-post-apocalyptic survival thriller that follows multiple characters as they struggle to make sense of a country on the verge of civil war, while simultaneously being attacked by terrorists, and secretly invaded by the Chinese and Russians. Basically, “Day of the Dog” is the worst segments of the daily news pushed to their extreme and thrown together in story form. 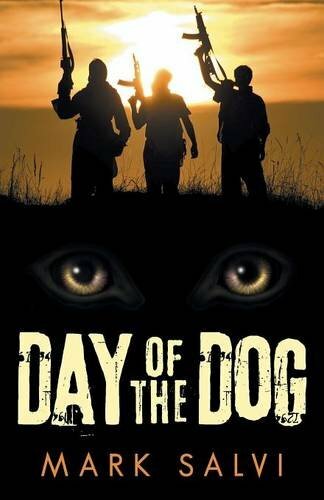 “Day of the Dog” has elements of military, political and survival thriller stories. It is a little slow to start, but given the number of story lines and characters, this is forgivable. What is less justifiable is the one-dimensional characters and flat dialogue; at one point there seemed to be about a page’s worth of “he said-she said” dialogue that just rambled on. In this sense, I yearned for the basic tenet of “show-not tell.” At other times, I found myself simply having difficulty caring about the characters because they didn’t seem that memorable. That being said, there are a lot of characters to keep track of, and while there is not a lot of character development, they do help move the story forward. Where “Day of the Dog” does shine is its complex story line that has multiple twists and turns, and creates a complex and terrifying setting. “Day of the Dog” is a survival thriller inspired by today’s media headlines and as a result, sometimes feels a little political. Whether the author is trying to make a political statement I cannot say, but because of the setting it is inevitable that he does. If you don’t mind that, or are able to read the story as pure fiction and not as prediction, then you may want to give it a shot. It is also important to note that “Day of the Dog” is a very pessimistic view of the future and as such, may not be for everyone. Ultimately “Day of the Dog” is the first book from this author and, as is all too common with first-time authors, Mr. Salvi has tried to cram every idea into it, which shows in the lack of character development, flat dialogue, and a storyline that is just not fully flushed out. It also means that I expect Mr. Salvi’s next book will be much improved, and while not perfect, is still an excellent first entry into the survival thriller genre. It also boasts a well-developed setting that would be fun to explore again, maybe next time with a more flushed-out story and deeper characters. Overall, I give “Day of the Dog” by Mark Salvi three out of five stars. Any story this big is a huge undertaking, and those who enjoy complex, multidimensional survival thrillers will appreciate the effort made by the author. This entry was posted in Action/Adventure, Fiction, Mystery/Thriller and tagged Book Review, Day of the Dog, Mark Salvi. Bookmark the permalink.